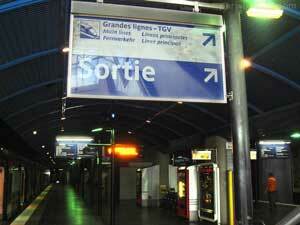 This article explains how to take a RER A train from Paris to Disneyland® Paris. 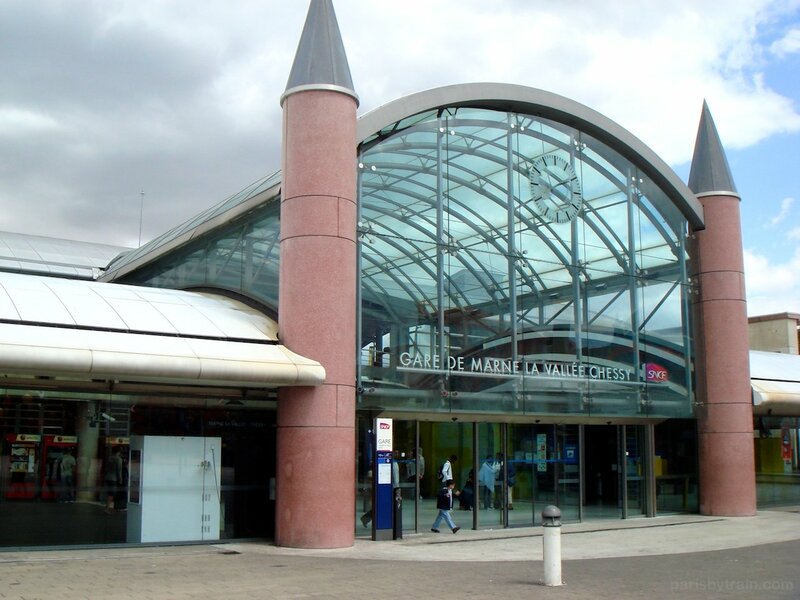 If you’re going from Charles de Gaulle airport to Parc Disneyland, you can take either a TGV train direct from CDG to Disney (Marne la Vallée) or first take the RER B train to Paris then at station Chatelet Les Halles, switch to the RER A train line towards Marne La Vallée. RER A city trains travel from central Paris to Disneyland throughout the day at roughly 15 minute intervals from five large central Paris RER A Stations: Charles de Gaulle Etoile (at Arc de Triomphe), Auber (at Galeries Lafayette shopping center), Chatelet Les Halles (massive underground shopping centre and largest underground/subway station in the world), Gare de Lyon (largest Paris train station), and Nation. A single one way ticket, a billet Ile-de-France, from central Paris to Disney costs (). You can buy these tickets from any metro or RER station ticket window or from the automated ticket vending machines (using coins or smart-chip enabled credit cards) within stations. 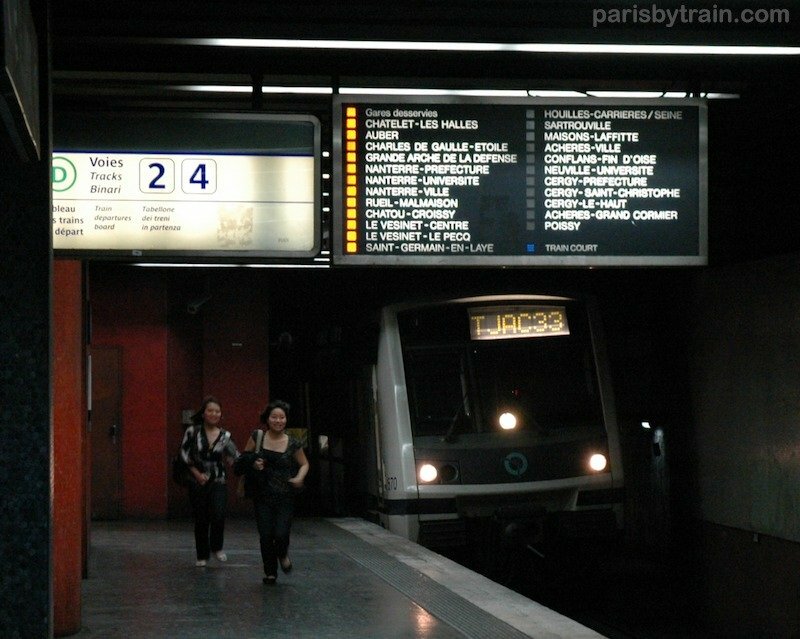 You can start your journey from any Metro / RER station within central Paris (Zone 1) using this one ticket and simply transfer to the RER A train line if you’re not already on it. You don’t need to buy a separate ticket just for the metro portion of your trip. 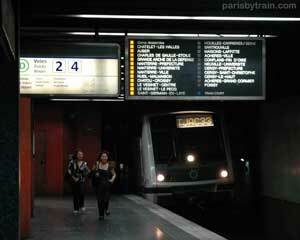 The normal metro ticket t+ will not work for this trip since Marne la Vallée / Parc Disney is in Zone 5. 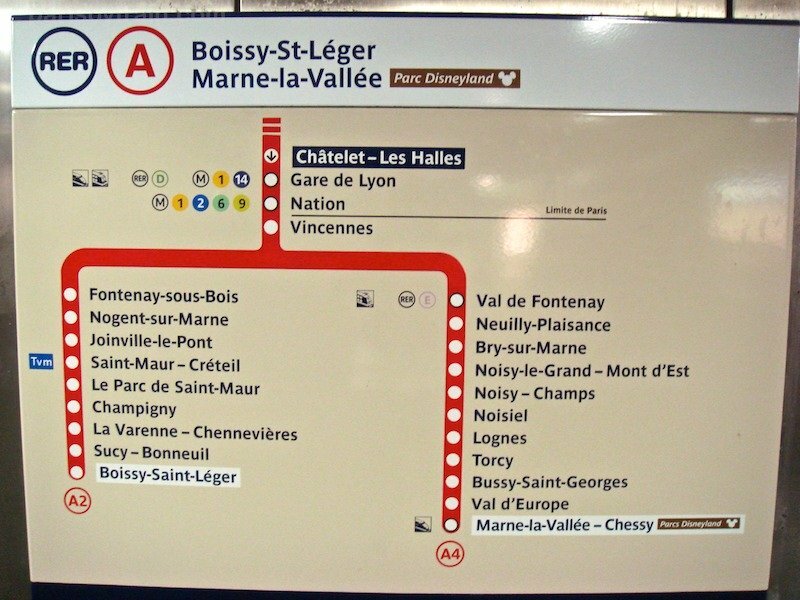 From inside any of the above mentioned Paris RER stations, you’ll want to take RER A train in direction Marne-la-Vallée, but keep in mind that the direction may also read Boissy-St-Léger such as in the photo below. 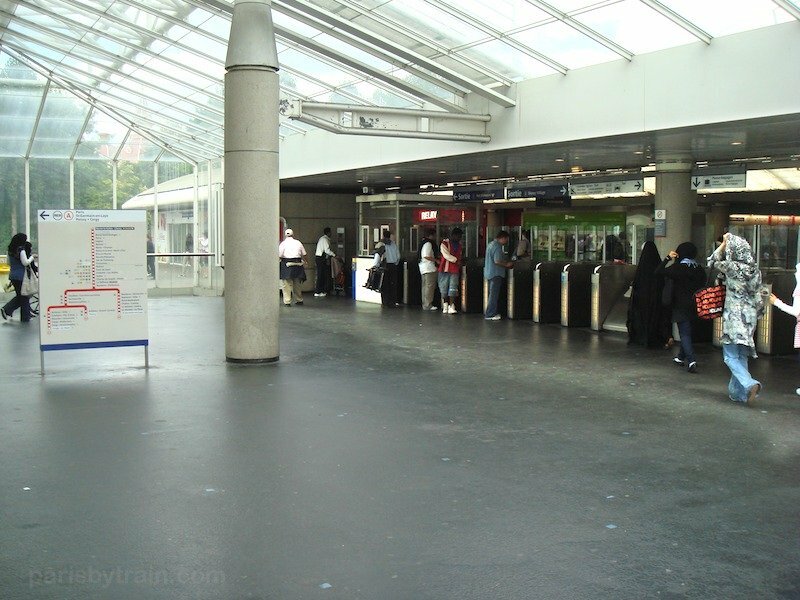 to indicate that you’re on the correct side of the platform: if you see your arrival station on the panel, you’re at least on the correct side of the platform. 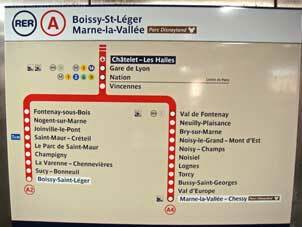 In this case you’d want to see Marne La Vallée – Chessy as one of the stations. to indicate whether the next train will stop at your desired station. 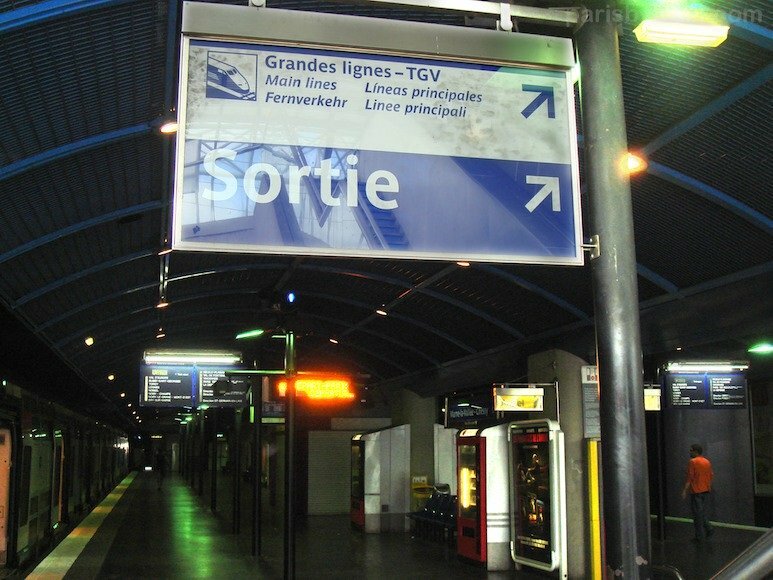 If Marne La Vallée – Chessy is lit with a yellow square, take the train. 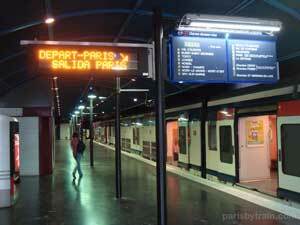 If not, wait for a train that will stop at Marne La Vallée/Parc Disney. Once on board a RER A train to DisneyLand Paris, remember to keep your ticket handy throughout your trip as you may be asked to show it to ticket checkers, known as controllers in France. If you fail to produce a valid ticket the controller will charge you a fine somewhere in the range of €40 payable on the spot through credit or debit card. And even though ticket vending machines don’t take non-smart chip credit cards, the mobile credit card swipe machines these controllers carry, definitely do. At the end of your trip you’ll also need your ticket or pass to exit through the turnstiles when you arrive at Marne La Vallée / Disney. 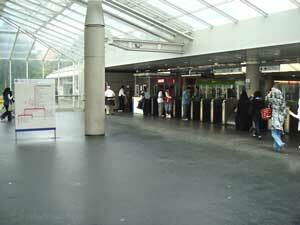 Using your billet Ile-de-France in the turnstiles allows you to pass through into the main section of the station which has an information booth, ticket window, and various shops selling newspapers/magazines and snacks. After exiting Marne La Vallée–Chessy station, you’ll notice the motif of the station itself is Disney-like with its castle like spires. 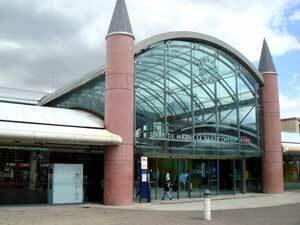 Here’s a panoramic photo of Marne La Vallée–Chessy RER/TGV station amongst some attractions at DisneyLand Paris. Have a great Disneyland visit.